The Dojo loach (Misgurnus anguillicaudatus) more closely resembles the black kuli loach in that its body is more eel-like, although it’s not quite as serpentine. These fish are either gold or pink in color. Like other bottom feeders, these fish have barbels around their mouths, which help them find food in the substrate. These fish are often referred to as the Weather Loach because some people claim their behavior changes whenever there’s a drop in barometric pressure. Some fish enthusiasts have even claimed these fish behave erratically right before a storm hits. In addition, the dojo loach is called the friendly fish because it will take food out of your hand. This, combined with its docile, hardy nature make them an ideal freshwater tropical fish for the beginner. This freshwater tropical fish hails from North East Asia and China and can usually be found in muddy rivers and lakes. Like many in the loach species, this fish in the wild travels with groups of their own kind, which means you’ll want to keep a group of them in your tank if you want them to be happy. 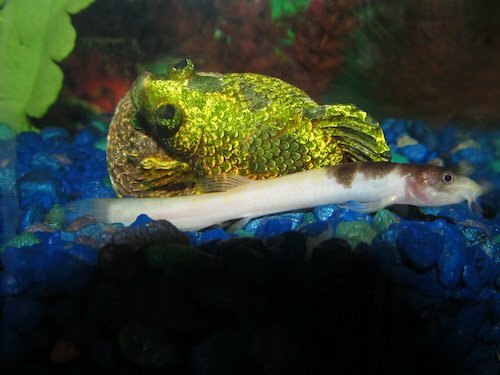 Like other loach species, the dojo loach is an omnivore and will eat virtually whatever it can find. 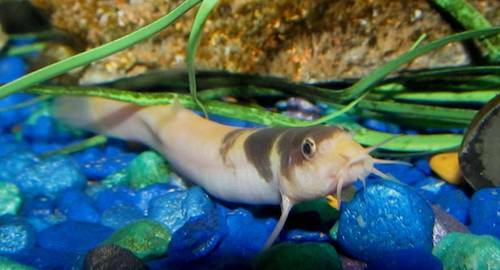 In the wild, the dojo loaches are omnivores and will eat both plant and animal matter. While they spend most of their time scavenging, they have been known to go after insects or snails. In your tank, these fish will do fine on a diet of high quality spirulina-based flake or pellet food with the occasional treat of tubifex, black worms or bloodworms. If you can’t get a spirulina-based food, you can substitute vegetables such as zucchini medallions, shelled peas and cucumber medallions. Like most scavengers, the dojo loach spends most of its time rooting around the bottom of the tank looking for food, which means you’re going to want to use a substrate that’s not too abrasive or hard. A good sand/gravel mix should do the trick. The dojo loach can grow to 12 inches, and since they like to be in groups of their own kind, you’re going to need a big tank — preferably 29 gallons minimum, although 55 gallons is recommended. Most aquariums can get by with an on the back filtration system, and the dojo loach will be fine with this setup, however a canister filter might be a better choice because these fish have a tendency to jump or crawl into a hang on back filter. In fact, these fish are notorious escape artists, so you’d be wise to have a secure hood on your tank. It’s interesting to note, however, that the dojo loach can breathe oxygen, and some hobbyists have claimed that even after being out of the tank for an hour or more, the dojo loach revives nicely once back in the aquarium. These fish will do well in moderately hard, cool water, 50-72˚ Fahrenheit with a pH of 6.5-8. And while they can live in tropical aquariums with warmer temperatures, this is said to reduce their lifespans considerably. If you take proper care of your dojo loaches, they can live for up to 10 years. As mentioned previously, these fish like to dig and need a loose substrate. 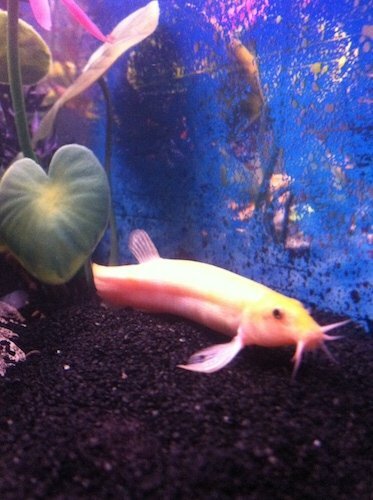 It’s not uncommon for dojo loaches to bury themselves up to their necks in the gravel or disappear completely for a day or more. Your dojo loaches can live on their own, but the solitary fish will spend most of their time hiding. Keeping them in groups of three or more makes them more social and comfortable, which makes it more pleasurable for the hobbyist who likes to watch their antics. The dojo loach is a cool water fish, which means you’re going to have to “trigger” them to get them to breed. To do this it’s recommended that, in the winter/spring months, you keep the temperatures. Also, limit the light they get in the winter and gradually increase it as spring approaches until they get a minimum of 12 hours of light in the tank. Once the fish are in breeding mode the males will court the females, and this process can last for several hours. The male wraps himself around the female until she releases her eggs and he fertilizes them. Once fertilized, the eggs normally hatch in only a few days. The fry are very small and can only be fed infusoria or specially designed fry food for the first week or two. After this, the babies can begin dining on baby brine shrimp or powdered spirulina pellets. 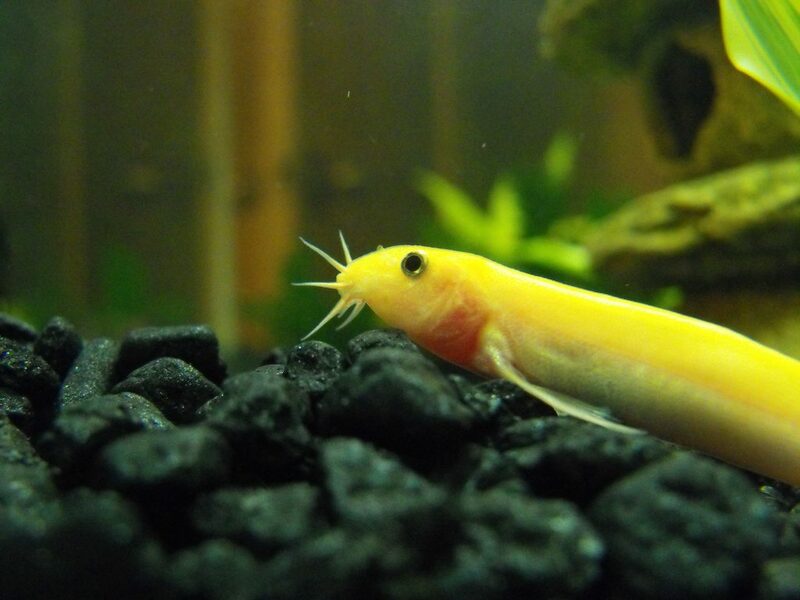 Dojo loaches can make for a wonderful addition to your freshwater aquarium. 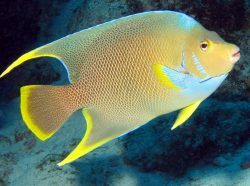 They are friendly fish whose antics make them fun to watch. They’re easy to care for and with the right touch, they’re easy to breed. This freshwater fish is a hardy species that’s a good choice for the beginning enthusiast. I have a 75 gallon tank and I have three Dojo’s. They stay hid a lot. I noticed that my Tiger barbs sometimes pick at them. 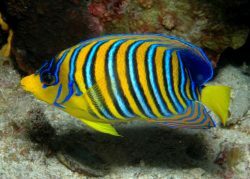 Are there certain fish that they should not be in the tank with them? Sorry to hear you are having issues with your Dojo’s. Tiger Barbs are aggressive and tend to be bullies in community tanks. They will pick and nip at smaller fish. 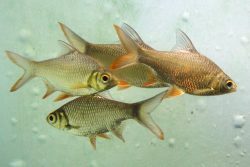 Have a look at our Tiger Barb page for more specific information on them. I would recommend trying to move either the Dojo’s or Tiger barbs to another tank if you want the Dojos to survive. The only other option would be to get a bigger tank, but you are already at 75 gallons. Hope you get this figure out for your poor little fish.